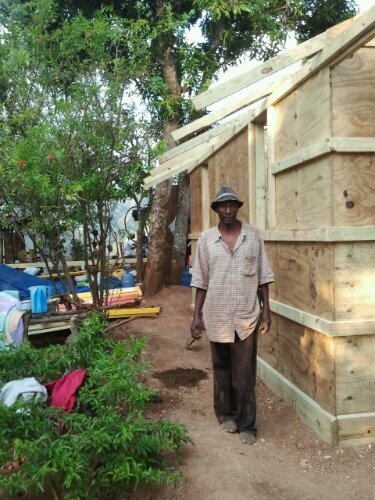 Mr. Pierre standing in front of his house, under construction, on Tuesday. Work continues to go very well on the second house. The crew is working hard and we’ve improved on some of the details that were missed last week. The trusses and purlins are up, the front and back doors are installed, and we’re looking at a good chance of finishing up tomorrow, ahead of schedule. Work days here tend to follow a routine. People are up early, around 6-6:30. There’s no full breakfast, but the family serves bread with very sweet strong coffee and sometimes hot chocolate as well — all grown right here. We work until lunchtime, have a simple meal, usually noodles, and then work a variable number of hours until we reach a good stopping point, most often around 4:00. Then it’s time to wash off and relax for a few moments before dinner around 5. Dinner is the big meal of the day and usually consists of rice served with stewed vegetables, black bean sauce, or a red sauce with onions. After dinner, the Haitian crew likes to play dominos, which is loud and competitive activity. Then, once it gets too dark to play, people drift off or stand around and chat. Sometimes one of the guys will break out his battery-operated DVD player and we’ll watch a movie, which could be anything from a comedy in creole to an American action movie. Then, around 10 at the latest, everyone’s off to their tent to sleep, and the next day it all starts again, until the house is done.